Decorative Frame, with a snap open design, is simple- to- use framing system that makes changing graphics easy. The dcorative black frames are in different sizes and fit into decorative use of picture frames serving the needs of advertisers and decorators. These black snap frames differ from conventional snap frame designs due to the decorative form. This decorative design catches viewer's attention onto the displayed advertisements. Having a more stylish design than traditional models, these black decorative frames will capture the eyes within any commercial environment. Suitable to use in shops, retail stores, restaurants, hotel receptions, banks and waiting areas. 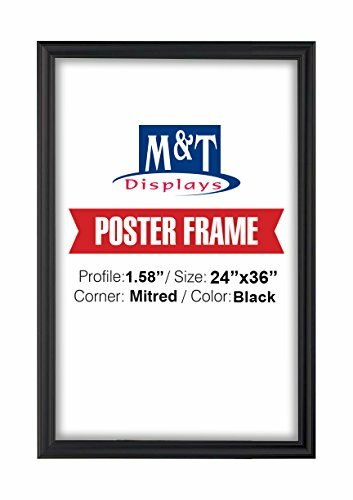 An ideal decorative frame for your 24" x 36" size posters. All required mounting hardware comes with the product as well as a easy-to- understand manual. Fancy Frame, with a snap open design, is a simple to use framing system that makes changing graphics easy. The Fancy Frames are in different sizes and fits in decorative use of picture frames serving the needs of advertisers and decorators. These clip frames differ from conventional snap frame designs due to the decorative form. This decorative design catches viewer's attention on the displayed advertisements. Having a more stylish design than traditional models, these picture frames will capture the eyes within any commercial environment. Suitable to use in shops, retail stores, restaurants, hotel receptions, banks and waiting areas. Each frame includes the wall fixing; 4 screws & 4 pegs). Each frame is packed individual in carton box. "Optional hangers" help easy mounting. Suitable for silk-screen printing max. letter height is 1 1/8 inch (28 mm). If you have any questions about this product by DisplaysMarket, contact us by completing and submitting the form below. If you are looking for a specif part number, please include it with your message.